Get the Flash Player to see this slideshow. 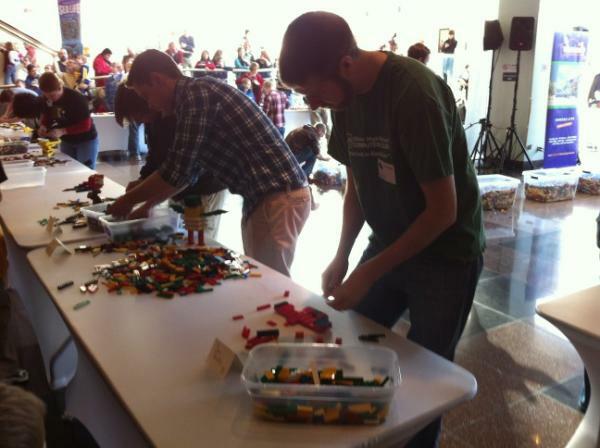 This Saturday, our very own Jon Shults participated in the LEGOLAND Discovery Center Kansas City Brick Factor Competition at the Crown Center Shops amongst 40 other contestants. "It was a lot of fun, I’m glad I did it. Most of my family came out to watch, and it was particularly enjoyable watching how much fun my nieces and nephews had, especially the moment they figured out what a competitor was building. You could watch their face snap from blank stare to giant smile. I didn’t make it past the first round, but I did hang around to watch what everyone else was building, and I was pretty impressed with what I saw. The guy who won definitely deserved to win it. It was kind of fun walking around Crown Center with the competitor name tag on, as just about everyone there recognized the name tag and had questions about the competition. I grew up building legos with my brother. They were my favorite toy as a kid, and I built with my step-son when he was younger. I look forward to building with my nephew Ben when he gets a bit older." You can read more about the competition by visiting LegoLand's Facebook page or the Kansas City Business Journal.